Zuni Bear Fetish Box - Native American Medicine Co. 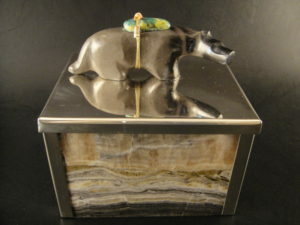 This one of a kind silver and stone medicine box has been constructed of Spirit Stone and 26 gauge Sterling silver. 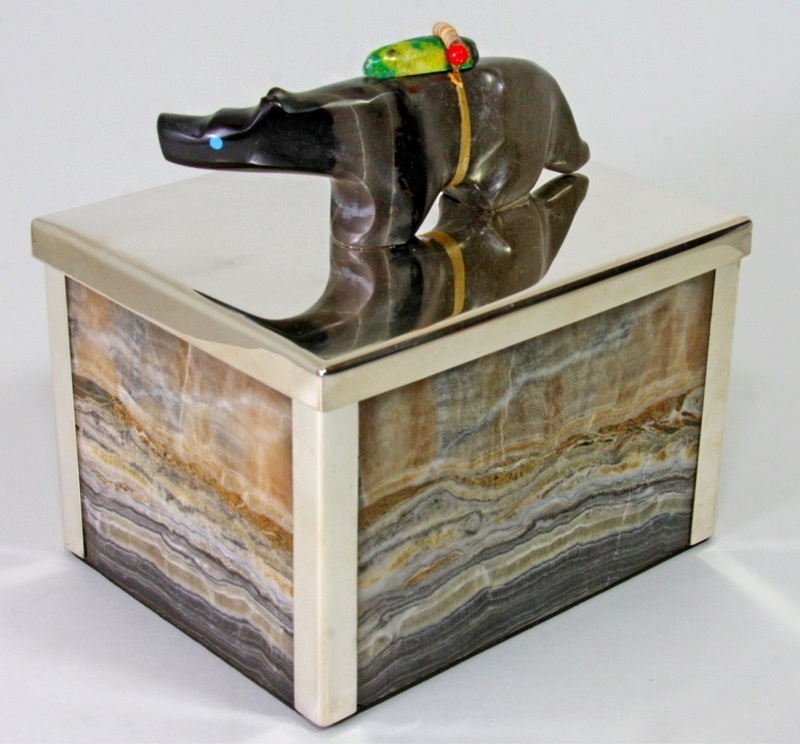 The lid is crowned by a genuine Zuni bear fetish hand carved by Lynn Quam. 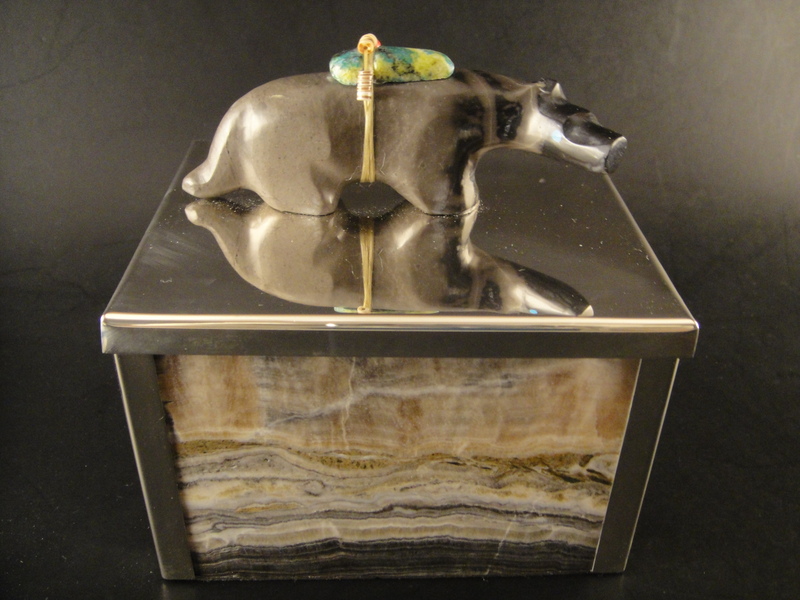 This one of a kind silver and stone medicine box has been constructed of Spirit Stone and 26 gauge Sterling silver. The lid is crowned by a genuine Zuni bear fetish hand carved by Lynn Quam (see below). Spirit Stone is a type of chalcedony or microcrystalline quartz. 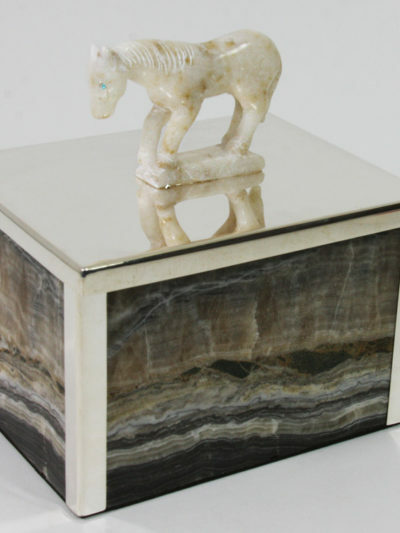 Chalcedony comes in a multitude of varieties and Spirit Stone is the Onyx variety. 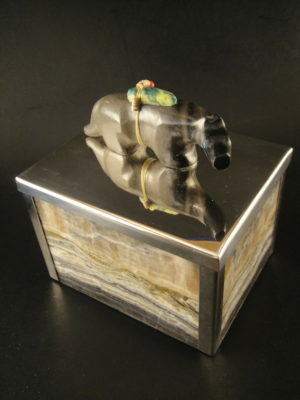 It is formed when silica is deposited in lava gas cavities which results in the unique bands or stripes that Onyx stones usually exhibit. The word Onyx comes from the Greek word ‘onux’, which means claw or fingernail, because the veins found on the stone look very much like the colors of a fingernail. Onyx may be a multilayered black and white stone, usually with a black base and a white upper layer, but it may also be brown and white, as in sardonyx; or red and white as in carnelian onyx. Onyx has a hardness of 6.5 to 7.0 on the Mohs scale. A very grounding stone, Onyx is beneficial for those to be thought flighty by nature, or one who is having difficulty concentrating or focusing one’s attention. It is a strengthening stone that may assist one in the approach to a lesson or task with greater self-confidence and determination. Onyx is a wonderful stone for anyone that is under extreme mental or emotional stress, bringing strength, balance, and harmony to the body and mind. It is thought to increase intuition, instinct, and happiness, as well as decreasing sexual desire when it comes with negative energy or habitual nature. Onyx is said to banish grief, enhance self-control, stimulate the power of wise decision making, as well as to assist one in absorbing the energies of the universe that one most requires. 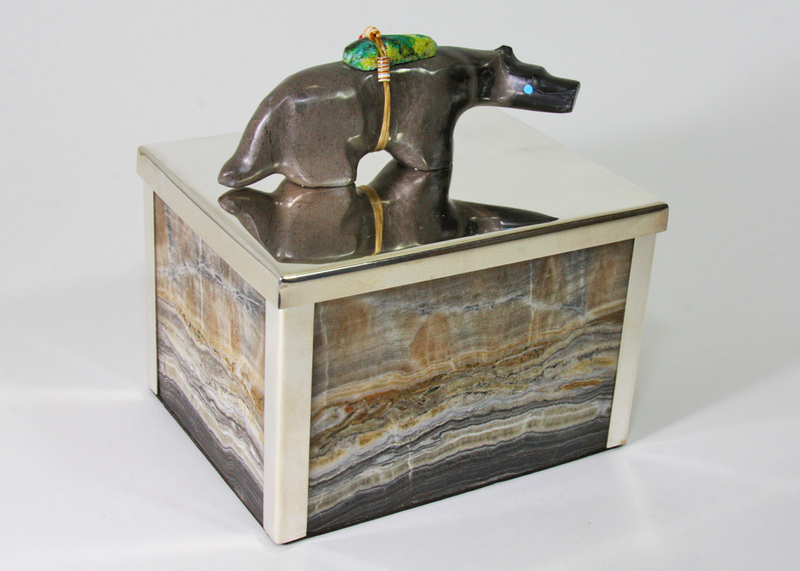 The bear fetish is hand carved from Picasso marble with turquoise inlaid eyes. To the Zuni, the bear represents immense healing and is a symbol of supreme power, strength, solitude, and introspection. 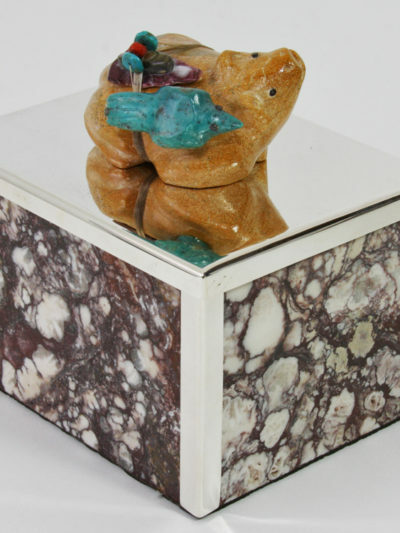 The bear is one of the Zuni’s six main directional guardians, protecting the West. 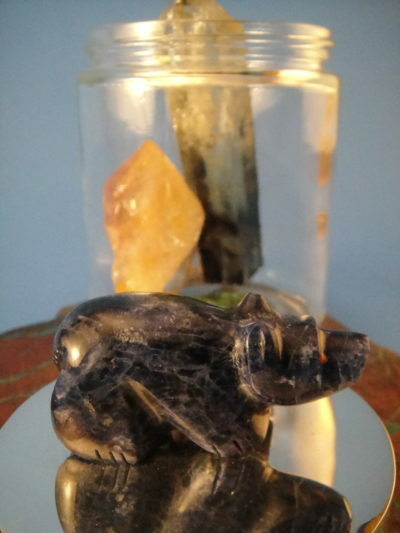 It is believed that the power of the Great Spirit breathes within bear. He is a champion in helping us overcome the depression of the spirit that is often connected with the deep introspective cycle of change and growth. Bear reminds us that this type of diminishing is actually a necessary state of hibernation. His wisdom reminds us that solitude is an immense power that we all, at times, need to focus on, in order to connect to our inner world. Bear teaches us how to go within and find the primal source that is essential for our survival. 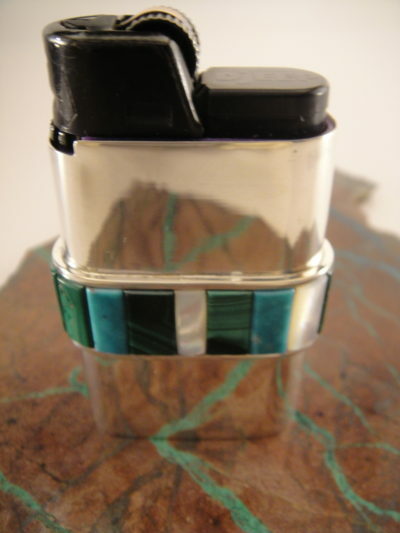 The Zuni regard the bear as invaluable when facing change, transition, and growth. The fetish includes a medicine bundle tied to its back by animal sinew. These bundles are meant as a gift offering to the animal spirit. The bundles provide the animal spirit with energy, enhancing its powers and allowing its prayers to be heard more easily. The arrowhead pointing forward defends it from obstacles in the future. 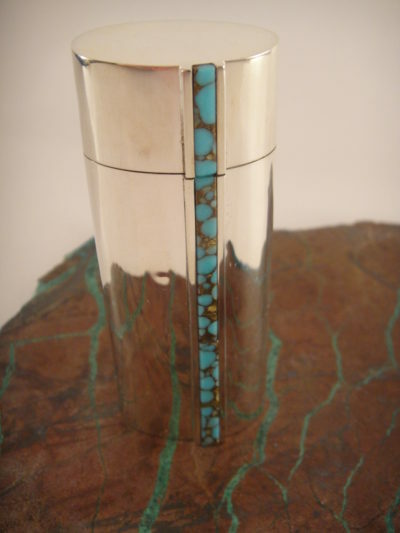 Lynn Quam is a well-known Zuni carver who prefers to do mostly buffalo or bison fetishes made from malachite, turquoise, wild horse marble, or Picasso marble. 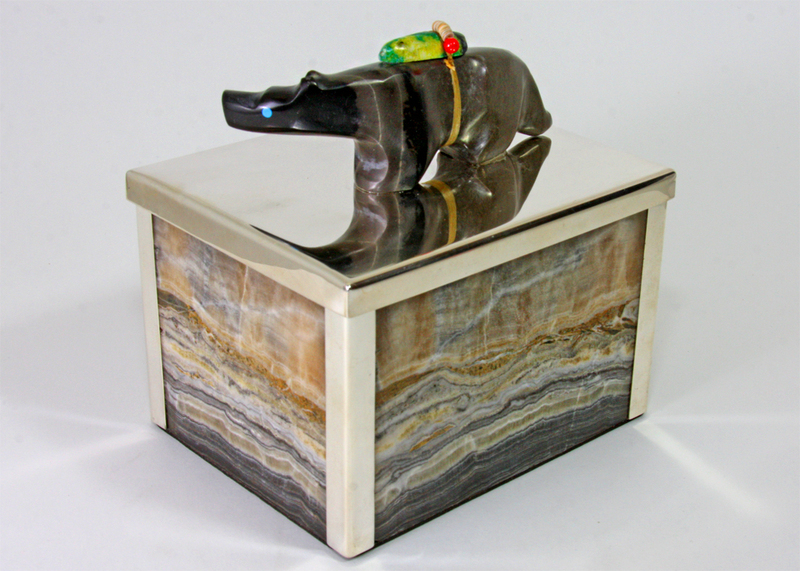 Lynn adorns his attractive buffalo with horns sometimes made of fossilized ivory and turquoise. Lynn’s mother, Annie Gasper Quam, was a well-known jeweler and fetish carver who died in 2001. His aunt, Ellen Quandalacey, was the matriarch of the well-known Quandalacey carving siblings. 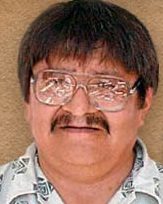 Lynn lives at Zuni Pueblo with his wife, Jayne Quam, who is a Navajo fetish carver. Box measures: 4 3/4″ x 3 3/4″ x 3 3/8″ without fetish.